This past Friday morning was an absolute tragedy… I ran out of coffee. I know. And I was on an early shift as well. Normally I’m really good with my coffee rations–I know just by looking at the jar I keep it in when it’s time to grab a bag on the way home. Somehow, this time, my low stock didn’t register and I woke up Friday morning to find myself scraping the jar for any remaining grounds. I thought I had enough to make a solitary cup… not so. The result was so weak I couldn’t even drink it. But now, running out of coffee is a thing of the past thanks to Pact. N had shown me their website a few days before my no-coffee morning and I’d kept meaning to have a look but just never got around to it. After running out, I thought there would be no better time to give Pact a try. 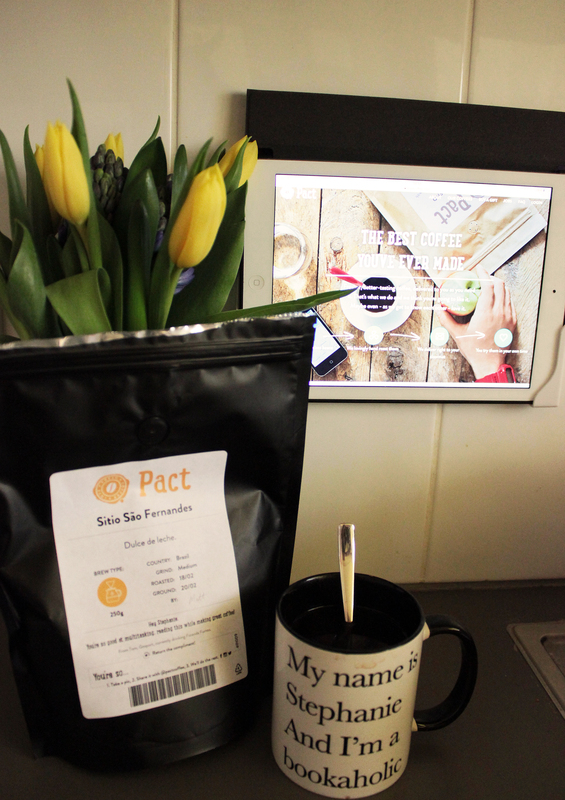 Pact is a coffee subscription service that sends you bags of freshly ground coffee every week (or other week, depending on your settings). They cater for all types of brewing methods, so whether you’re a filter girl like me or an Aeropress aficionado, Pact have you covered. Decaf, you say? No way, I say. But unlike me, Pact don’t discriminate–they do decaf too. What really struck me about Pact was the variety of coffee on offer and how they described the taste of each. Dulce de leche? Oh yes please. Chocolate toffee? Alright then! Mind you, these aren’t flavoured coffees–these are just the flavour notes in each. All coffee beans are sourced ethically and the company has a great relationship with their farmers. If you’re interested in learning more about Pact‘s coffee sourcing, check out their blog article here. Ok, but what about ordering? Is it easy? Yep. Even with my de-caffinated brain, setting up an account and placing your first order is super easy. I’d actually found a voucher code online which gave my my first bag of coffee for just a measly pound. £1 people… for a bag of quality coffee. Amazing. Back to that in a minute. Full disclosure, when I placed my first order the website was buggy and a bit glitchy. I wasn’t sure if my order had been placed but a quick email to the customer care team put me at ease. They emailed back straightaway and reassured me that my order had gone through and they’d apologised for the website being a bit funky. I’ve logged on this morning and all seems ok! Just one of those things. One of the best things about Pact? I ordered my first bag Friday morning. It came through my letterbox Saturday morning, just in time for breakfast. How’s that for service? And you can pause deliveries anytime through your account page. I have a feeling I’ll have to pause every couple of weeks to get through the coffee… I generally do a cup on weekday mornings and two on Saturdays and Sundays. But that’s ok! Anyway, what was in the package? 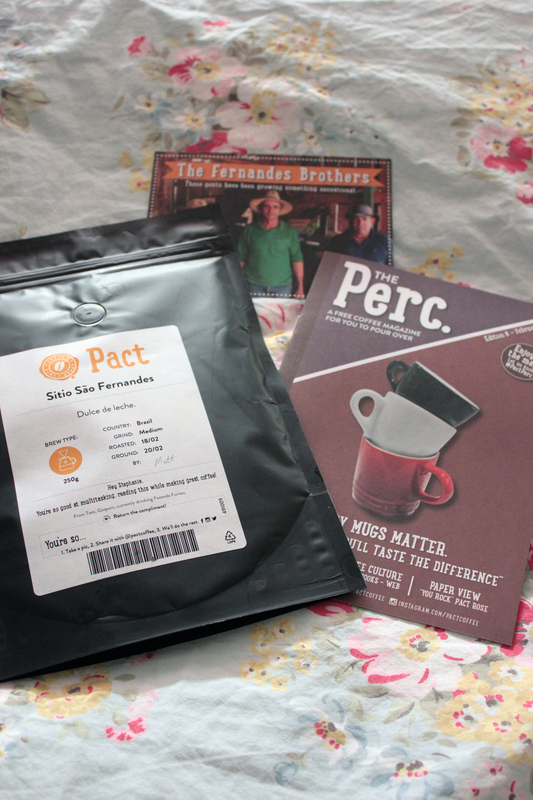 Other than the coffee, my shipment came with a little mini magazine and info card about the farmers. Great stuff. As you can see, I opted for the dulce de leche coffee, Sitio São Fernandes. This is their limited edition coffee for this month and it’s normally £8.95 for the bag (normal coffees are priced around the £6.95 mark). I got it for £1.00. Yes, £8.95 is more than I would normally pay for a bag of coffee however, I can absolutely vouch for the taste and can’t wait to try out the others on offer. This is hands down one of the best coffees I’ve ever had at home. I say that without reservation. I’m normally a milk and sugar kind of gal but the Sitio São Fernandes is so good, I had it black with just a bit of sugar. Right. If you’ve stuck around through my raving this long, you should be rewarded. I’ve got a voucher code for you that will let you order your first bag for £1. Sadly, because their coffee is super fresh, Pact don’t ship internationally, so this one’s for my UK people only. Just enter in STEPHANIE-IK_A3W when placing your first order. It’s that simple. Would you say it’s good value for money? Something I’ve been contemplating for a long time. I think it is for sure… I’m still using Pact and have a bag delivered every other week now (I use less as I’m the only coffee drinker!). Yes, it’s a bit more expensive than a normal bag of coffee but it makes up for that in being damn good coffee!